Hjertvatnet (Norwegian) or Vájmmojávrre (Lule Sami) is a lake in the municipality of Ballangen in Nordland county, Norway. 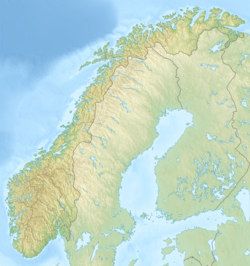 The 2.44-square-kilometre (0.94 sq mi) lake is located between the lake Børsvatnet and the lake Melkevatnet. ^ "Hjertvatnet" (in Norwegian). yr.no. Retrieved 2012-05-21. This page was last edited on 12 January 2019, at 20:25 (UTC).